Just how certain are the Indianapolis Colts that quarterback Peyton Manning doesn't figure in their future plans? So certain in fact, that the organization decided weeks ago that they would move forward without the future Hall of Famer as their signal-caller, according to a circulating report. Sources involved in Indianapolis' search for a new general manager told NFL.com's Jason LaCanfora that, "the organization was already planning to move on from Manning weeks ago, well before the public squabble between the quarterback and his owner." Manning and owner Jim Irsay issued a joint statement yesterday that insisted both sides were on the same page. This coming after Irsay described Manning as a "politician" on Thursday. Earlier in the week, in an interview with the Indianapolis Star, Manning shared his thoughts on the Colts various departures over the past few weeks, and how the mood around the team's complex had changed. Manning is owed a $28 million roster bonus this offseason after missing all of 2011 due to neck surgery. LaCanfora reports that Indianapolis will make a move on Manning "almost certainly" before the start of the 2012 NFL Scouting Combine. The team is expected to take Stanford quarterback Andrew Luck with the top overall pick in the draft. Wow. I'm really amazed at how quickly these teams can kick guys who helped make their franchise to the curb. I know the NFL is a business and all, but still. The thought of Manning playing somewhere besides Indy is mind blowing to me, but it looks like it's going to happen. I'd rather he just retire. 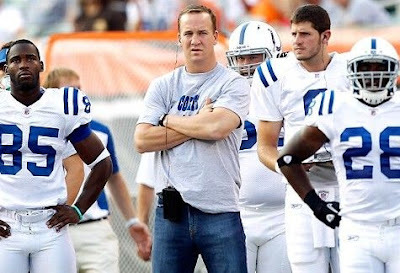 The Colts are ingrates treating Peyton like this. They were bums before he arrived. You have to take loyalty and pride out of the equation sometimes, as sad as it is. They stand to lose a TON of money on a guy who may not even be able to play AGAIN this season, or ever again for that matter. Yes, it is a business. It's not like Peyton would be willing to give back the money he was paid or take a pay cut either, so let's not put this all on the Colts organization. These things just happen, it's a part of the business side of football. And to all these Titans fans out there hoping and praying Peyton ends up there, please, for the LOVE OF GOD, stop. Forget it. Be happy for once that you have a halfway decent QB and quit trying to change the friggin' past. Aggravates the piss outta me. I'm with Brian. If you're Jim Irsay, you'd be out of your mind to give $28 million to a "loyalty cause" to stand on the sidelines with a clipboard. At some point you have to cut your losses and start fresh. If Peyton can't play, what's the purpose in keeping him on the payroll? That's a terrible business decision and quite frankly a decision that could ultimately cost the Colts the opportunity to move forward with their club. The Colts owe Manning nothing. I don't see him offering to give back his salary from last season when he didn't play a single down. When Indy releases him, it'll be strictly business. Nothing more, nothing less.